I’ve always felt that patriarchal society has forced women into roles that not only constrict and deform their true, instinctive selves but also extinguish their innate nobility and greatness. What would a totally “natural” woman act like? How would such a woman think? What would she be if she didn’t have to define herself first and foremost in relation to men? Last of the Amazons was great fun to write. I got to re-imagine the all-female warrior society of ancient legend. The myths tell us that the Amazons fought on horseback (in an era when male warriors were armored foot fighters, like Achilles or Hector), that they were the first to devise cavalry tactics and the first to use weapons of iron (when men fought with vastly inferior bronze.) The Amazons fought with the bow and the throwing axe, the pelekus. In infancy each Amazon’s right breast was seared, so that she would grow muscular to throw the axe and the spear. Amazon society thrived, the legends say, around 1250 BCE, the era of the Trojan War. Their country was the steppe and prairie around the Black Sea. I imagined Amazon society as a horse culture, like the Sioux or the Comanche. Graves of the Amazons show them buried with horses and bridles, axes and bows. The names given to Amazon warriors in legend—Melanippe, “Black Horse,” Alcippe, “Powerful Mare,” and Hippolyta, “Horse Running Free”—reinforce this. In other words, fighting in that era, on horseback, on that cavalry-friendly ground, using those weapons and tactics, it is not hard at all to imagine “women the equal of men” not just theoretically but physically. 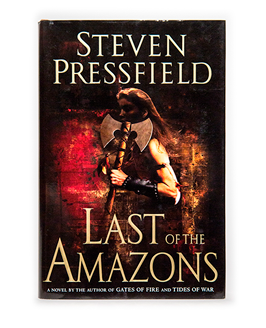 Last of the Amazons is the only book I’ve written with a female narrator. That was fun too.